Kyle Theirmann is a pro surfer with a passion to systemically affect change. Combining surfing great waves around the world with making a series of short films about current issues, Thiermann focuses on the power we have to create a better world through everyday actions that we take. His first video, Claim Your Change, details how money kept in multinational banks is used to finance destructive projects all over the world. 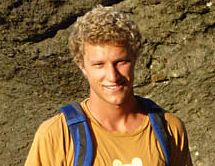 Kyle has surfed his way across Indonesia, Chile, Peru, El Salvador, Costa Rica, Mexico, Australia, Hawaii and throughout the U.S. He uses the support from his sponsors including Patagonia to generate publicity that encourages people to take action to transform their communities and the world. Kyle’s work has been featured in dozens of media outlets worldwide including Surfer Magazine and The Huffington Post. Kyle speaks at universities, high schools, and elementary schools throughout California.